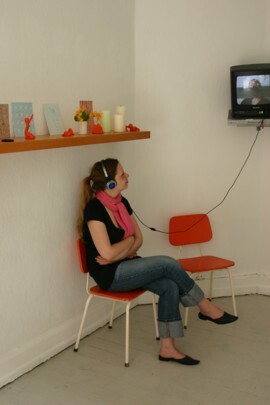 Female outlet is a project by Tine Oksbjerg, Karen Petersen and Line Sandvad Mengers. Structures from shopping culture are used as a means of communication. The starting point is the notion of storytelling;...you create your world, through the stories you tell about your self... We focus on the positive stories, to provide a breeding ground for more spaces, filled with success. Female outlet takes place in a shop in the city’s shopping area. The place imitates other shops by looking like a regular lifestyle shop. People will enter the shop, with an expecting to consume. In the shop nothing is for sale, instead the visitor enters a space where positive stories are being told. The stories are worked up into video, text, sound ect. 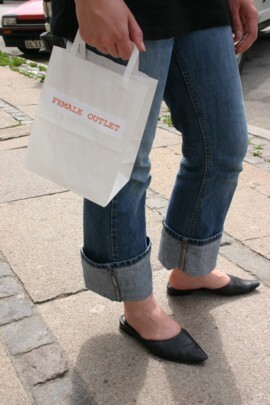 The guests leave the shop with an empty shopping bag, to carry the success on.